Expiry day saw Nifty open weak and stayed within a small range for the better part of the day; with short covering rally in the dying minutes saw the index closed just above the previous day’s close at 6124.05, a small gain of 19.75 points and in the process had a highest expiry till date. The broader market though was negative, with 516 advances to 767 declines. Option Table at start of series has good support building up around 6000 level. Call option 5600-6600 added 46.93 lacs huge amount of OI. Put option 6500-5600 added 43.76 lacs huge amount of OI. Highest accumulation on Call option 6300 at 32.72 lacs & 6200 at 31.62 lacs whereas Put option 6000 at 55.44 lacs & 5900 at 41.30 lacs. Nifty Open Interest is at 1,75,91,300 up by 44,86,100, whereas May series covered 19.24 lacs with small increase in price, most probably 100% rollover with huge long addition. Bank Nifty Open Interest is at 11,55,900, up by 4,46,650, whereas May series covered 3.53 lacs with small decrease in price, most probably 100% rollover with small short build-up. FII’s bought huge 18.92 lacs of Futures, most probably long build-up, as their net OI increased by 47524 contracts and the average price per contract comes to around 6142. FII’s future open contract as on date is 681785. PCR Open Interest (Volume) is comfortably placed at 1.236 at start of series. Best Support at 6000, with highest OI of 50.44 lacs and below that at 5900 with huge OI of 41.30 lacs. 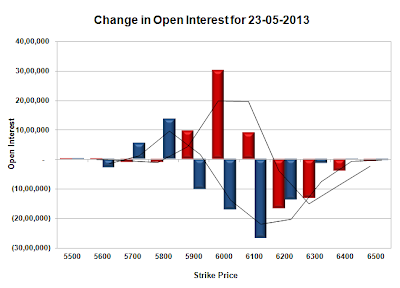 Initial resistance right now at 6200, but OI is just 31.62 lacs and above that at 6300 with OI of 32.72 lacs. Range as per Option Table is 6055 - 6172 and as per VIX is 6073 - 6175 with 6100 as the Pivot. Nifty opened weak and stayed within a small range for the better part of the day; with up-move in the dying minutes saw the index closed just below the previous day’s close at 6104.30, a small loss of 6.95 points and in the process stayed above the psychological level of 6100. The broader market was negative, with 480 advances to 796 declines. Option Table for doomsday is perfectly poised at the centre of the best support at 6000 and the super resistance at 6200. Call option 6100-6200 added 9.13 lacs huge amount of OI with short covering seen at 6000 and lower strike prices. Put option 6000-5900 added 5.88 lacs huge amount of OI with huge profit booking seen at 5800 and below strike prices. 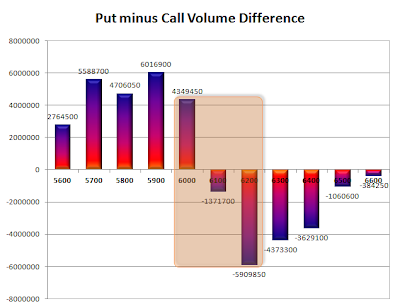 Highest accumulation on Call option 6200 at 71.80 lacs & 6100 at 67.39 lacs whereas Put option 5900 at 77.46 lacs & 6000 at 73.27 lacs. Nifty Open Interest is at 1,59,63,900 down by 24,09,000, whereas June series added 31.93 lacs with not much change in price, most probably 100% rollover with some long addition. Bank Nifty Open Interest is at 9,29,225, down by 3,85,475, whereas June series added 3.14 lacs with small decrease in price, most probably 82% rollover with small long liquidation. FII’s bought 6.65 lacs of Futures, most probably long build-up, as their net OI increased by 40161 contracts and the average price per contract comes to around 6114. FII’s future open contract as on date is 634261. PCR Open Interest (Volume) is comfortably placed at 1.411. Best Support at 6000, with huge OI of 73.27 lacs and below that at 5900 with highest OI of 77.46 lacs. 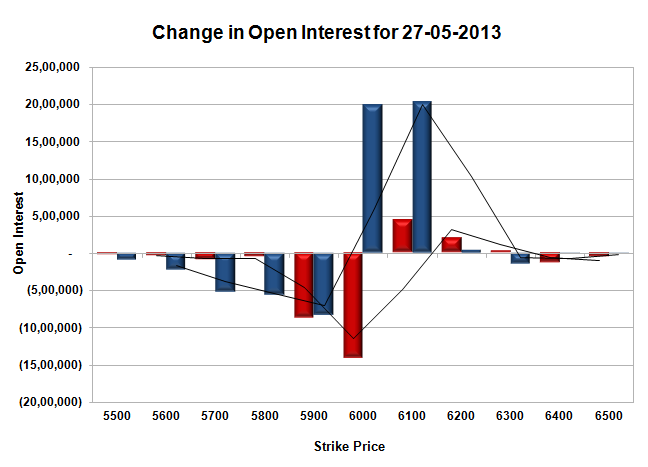 Best Resistance right now at 6200, with OI of 71.80 lacs. Range as per Option Table is 6041 - 6160 and as per VIX is 6047 - 6161 with 6080 as the Pivot. Nifty opened flat and after a small up-move above 6100, saw a dip towards 6060, which was promptly bought in by the responsive buyer to push the index towards the highs of the day around 6128, but closed marginally lower at 6111.25, a small gain of 28.10 points and in the process captured the psychological level of 6100. The broader market was just positive, with 667 advances to 629 declines. Option Table for expiry week looks slightly tilted towards the Bulls. Call option 6200-6300 added 8.49 lacs huge amount of OI with short covering seen at 6100 and lower strike prices. Put option 6100 added 10.29 lacs huge amount of OI with huge profit booking seen at 6000 and below strike prices. 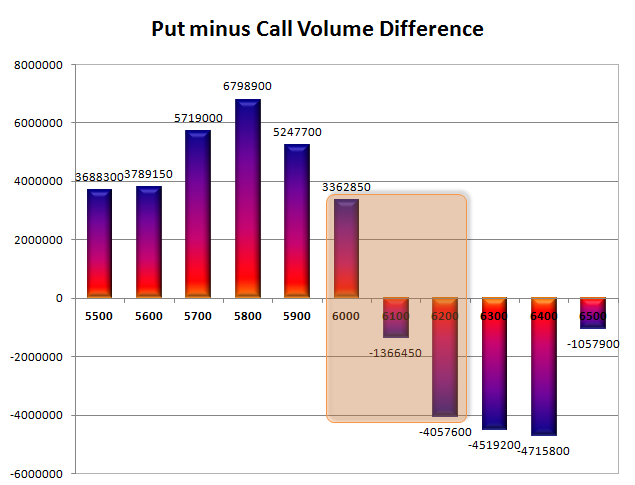 Highest accumulation on Call option 6100 at 66.36 lacs & 6200 at 63.70 lacs whereas Put option 5900 at 73.44 lacs & 6000 at 71.41 lacs. Nifty Open Interest is at 1,83,72,900 down by 37,02,700, whereas June series added 47.60 lacs with increase in price, most probably 100% rollover with huge long addition. Bank Nifty Open Interest is at 13,14,700, down by 1,26,500, whereas June series added 1.29 lacs with no change in price, most probably 100% rollover with small long build-up. PCR Open Interest (Volume) has again back above 1.4 and now at 1.414. Best Support still very much at 6000, though covered some, but OI is still 71.41 lacs and below that at 5900 with OI of 73.44 lacs. 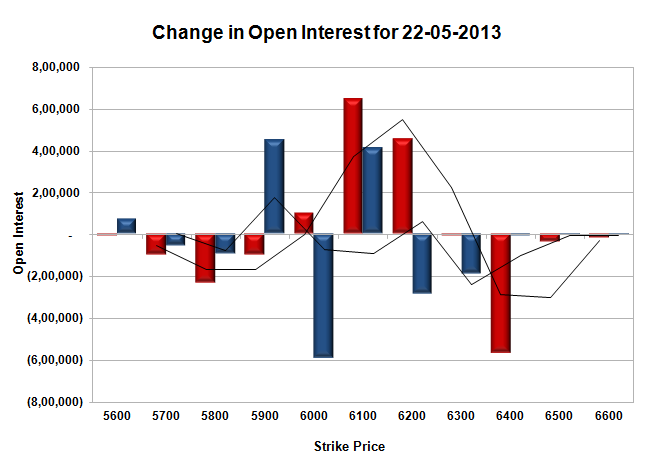 Resistance right now at 6200, with OI of 63.70 lacs. 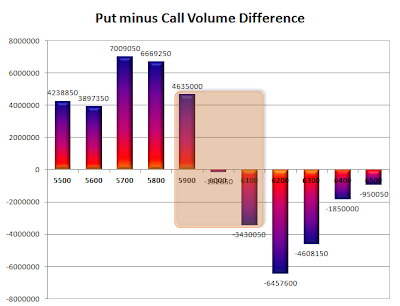 Range as per Option Table is 6043 - 6159 and as per VIX is 6056 - 6166 with 6080 as the Pivot. Nifty opened flat and after a initial dip saw the buyer take control and moved the index up by more than 100 points to touch 6100, but closed marginally lower at 6083.15, a super gain of 99.60 points and in the process captured the psychological level of 6000 with much to spare. The broader market was also positive, with 815 advances to 473 declines. Range as per Option Table for expiry week is playing well enough and remains same as 5900-6180. 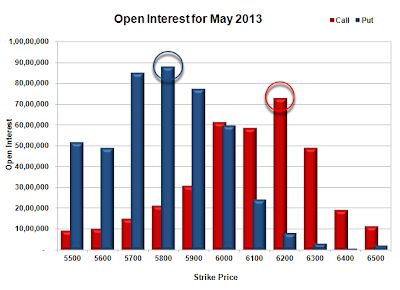 Call option 6100-6300 added 6.74 lacs huge amount of OI with short covering seen at 6000 and lower strike prices. Put option 6200-6000 added 40.54 lacs huge amount of OI with huge profit booking seen at 5900 and below strike prices. 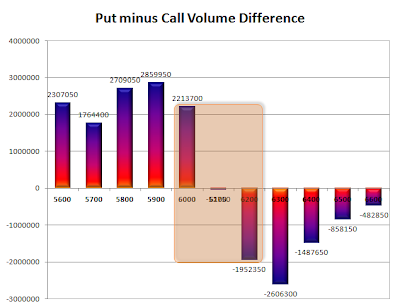 Highest accumulation on Call option 6100 at 83.67 lacs & 6200 at 57.28 lacs whereas Put option 6000 at 79.42 lacs & 5900 at 72.72 lacs. Nifty Open Interest is at 2,20,75,600 down by 21,27,150, whereas June series added 24.71 lacs with huge increase in price, most probably 100% rollover with small long addition. Bank Nifty Open Interest is at 14,41,200, down by 16,325, whereas June series added 0.97 lacs with increase in price, most probably 100% rollover with huge long build-up. FII’s bought 2.76 lacs of Futures, most probably long build-up, as their net OI increased by 5804 contracts and the average price per contract comes to around 6107. FII’s future open contract as on date is 581184. PCR Open Interest (Volume) has again jumped to 1.272. 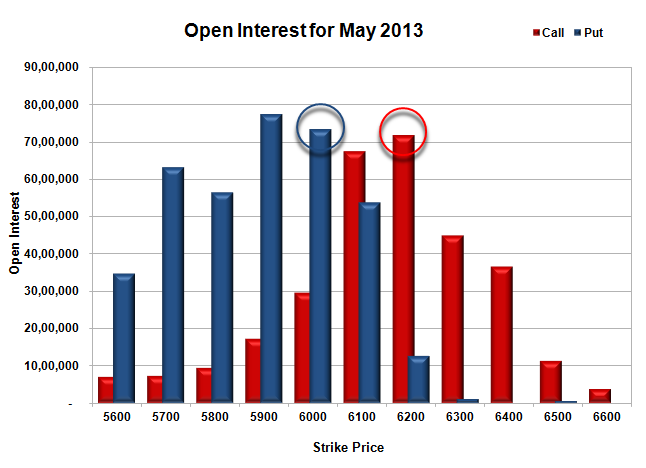 Best Support has just moved up at 6000, with huge OI of 79.42 lacs and below that at 5900 with OI of 72.72 lacs. Best and only worthwhile resistance right now at 6100, with highest OI of 83.67 lacs and above that at 6200 with huge OI of 57.28 lacs. Range as per Option Table is 6002 - 6119 and as per VIX is 6029 - 6137 with 6060 as the Pivot. Nifty opened up on the back of good global cues after the huge drubbing received yesterday, but was sold off instantly to the lows of the day at 5936. The responsive buyers took control at the lows to move the index back above the previous day’s close and ultimately shut shop at 5983.55, a small gain of 16.50 points. On a week on week basis the index lost 203.75, or around 3.29%, the biggest weekly loss in many weeks. The broader market was just positive, with 700 advances to 591 declines. 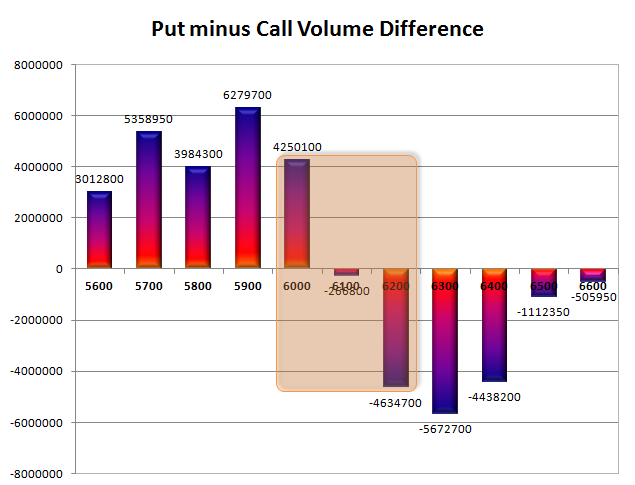 Range as per Option Table for expiry week comes to around 5900-6180.. Call option 5900-6100 added 19.68 lacs huge amount of OI with huge profit booking seen at 6200 and above strike prices. 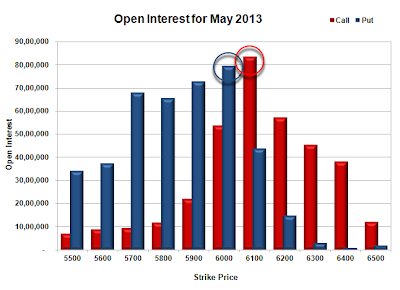 Put option 6000-5600 added 23.44 lacs huge amount of OI with huge short covering seen at 6100 and above strike prices. 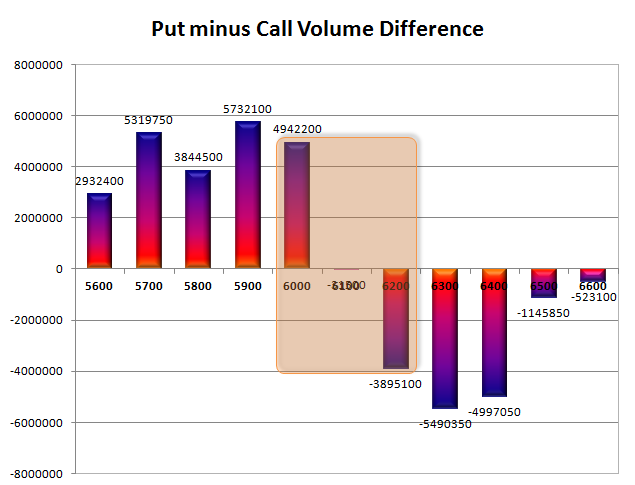 Highest accumulation on Call option 6100 at 79.20 lacs & 6000 at 67.78 lacs whereas Put option 5900 at 81.02 lacs & 5700 at 73.21 lacs. Nifty Open Interest is at 2,42,02,750 down by 7,31,600, whereas June series added 3.8 lacs with small increase in price, most probably some rollover with huge short covering. Bank Nifty Open Interest is at 14,57,525, down by 52,200, whereas June series added 0.35 lacs with increase in price, most probably some rollover with huge short covering. FII’s bought 3.71 lacs of Futures, most probably short covering, as their net OI decreased by 17673 contracts and the average price per contract comes to around 6006. FII’s future open contract as on date is 575380. PCR Open Interest (Volume) is stagnant around 1.160. 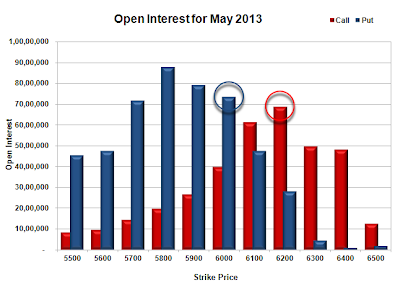 Best Support now at 5900, with highest OI of 81.02 lacs and below that at 5800 with OI of 71.23 lacs. 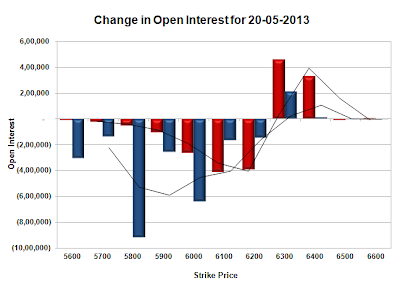 Resistance right now at 6000, with OI of 67.78 lacs and above that at 6100 with huge OI of 79.20 lacs. 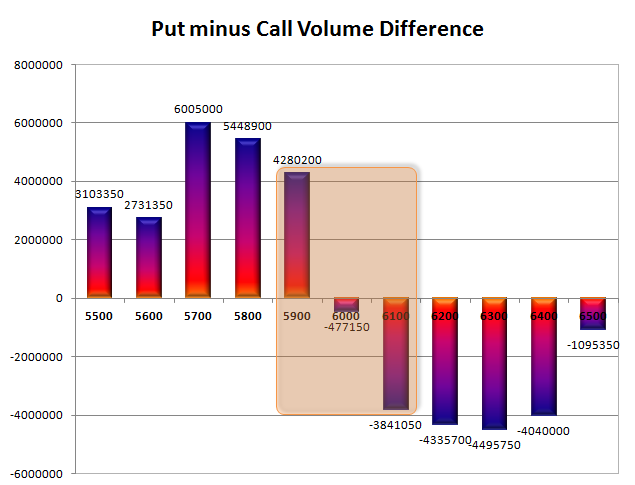 Range as per Option Table is 5923 - 6038 and as per VIX is 5928 - 6039 with 6000 as the Pivot. Nifty opened weak around 6050 level and was sold-off from the word go, with no buying seen at all. The index ultimately closed at 5967.05, a huge loss of 127.45 points. Nifty closed below the psychological level of 6000 and saw the biggest loss in recent days. The broader market was also weak, with just 196 advances to 1108 declines. Range as per Option Table comes to around 5900-6145 for the rest of week and maybe till expiry. Call option 5900-6100 added 49.00 lacs huge amount of OI with huge profit booking seen at 6200 and above strike prices. Put option 5800-5700 added 19.24 lacs huge amount of OI with huge short covering seen at 6000 and above strike prices. Highest accumulation on Call option 6100 at 69.55 lacs & 6200 at 61.45 lacs whereas Put option 5900 at 72.65 lacs & 5700 at 70.61 lacs. 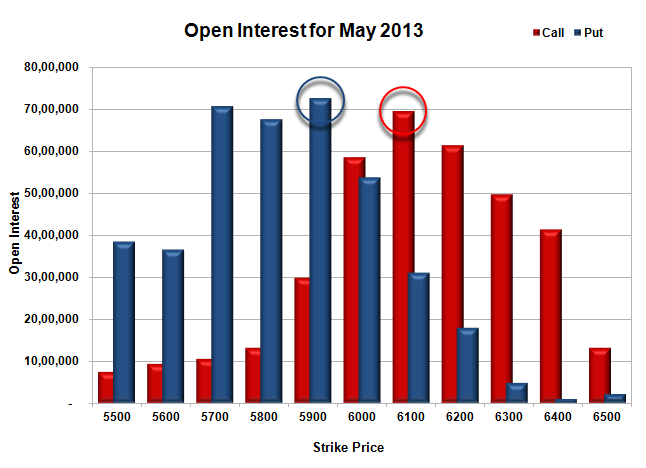 Nifty Open Interest is at 2,49,34,350 down by 16,50,150, with decrease in price, most probably huge long liquidation. Bank Nifty Open Interest is at 15,09,725, down by 2,69,900, with decrease in price, most probably huge long liquidation. FII’s sold 8.04 lacs of Futures, most probably long liquidation, as their net OI decreased by 28723 contracts and the average price per contract comes to around 5985. FII’s future open contract as on date is 593053. 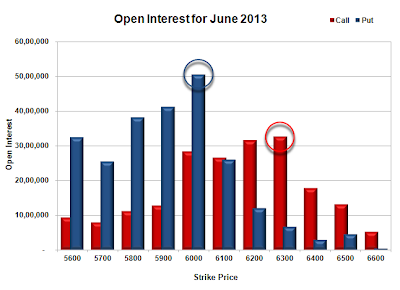 PCR Open Interest (Volume) is down to 1.157 due to huge short covering at 6000 and above PE levels. Support moved down to 5900, though covered huge, but still has highest OI of 72.65 lacs and below that at 5800 with OI of 67.65 lacs. Initial resistance now at 6000, with huge addition of 30.16 lacs for the day and above that at 6100 with highest OI of 69.55 lacs. 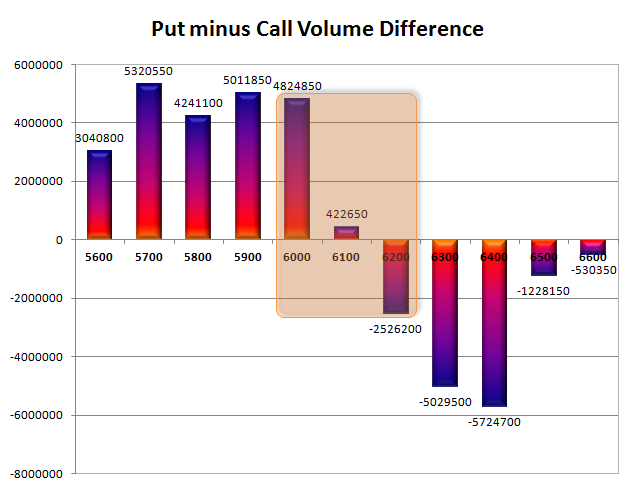 Range as per Option Table is 5933 - 6050 and as per VIX is 5909 - 6026 with 6000 as the Pivot. Nifty opened positive, but was unable to sustain the gap and came down in the afternoon session to touch the lows around 6074 and closed below the psychological level of 6100 at 6094.50, a small loss of 19.60 points. The broader market was also weak, with just 394 advances to 901 declines. Range as per Option Table comes to around 6000-6220 for the rest of week and maybe till expiry. Call option 6000-6200 added 12.04 lacs huge amount of OI with huge profit booking seen at 6400 and above strike prices. 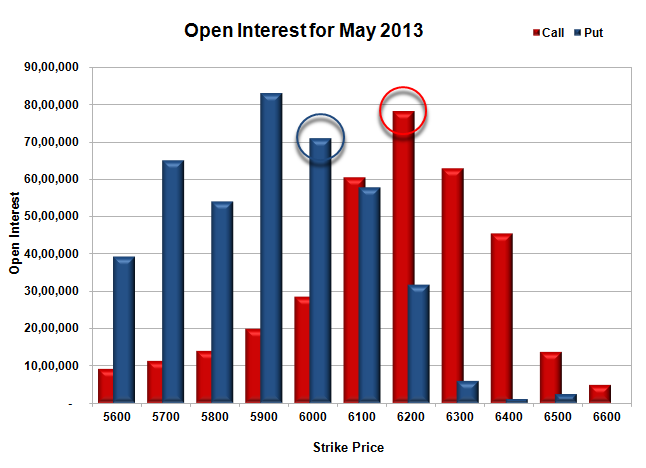 Put option 6100, 5900 added 8.63 lacs huge amount of OI with short covering seen at 6200 and above strike prices. Highest accumulation on Call option 6200 at 78.16 lacs & 6300 at 62.83 lacs whereas Put option 5900 at 82.91 lacs & 6000 at 70.98 lacs. 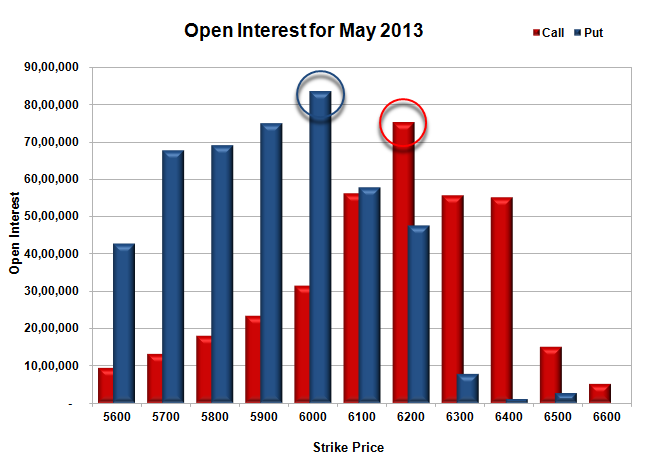 Nifty Open Interest is at 2,65,84,500 up by 6,28,500, with decrease in price, most probably some short build-up. 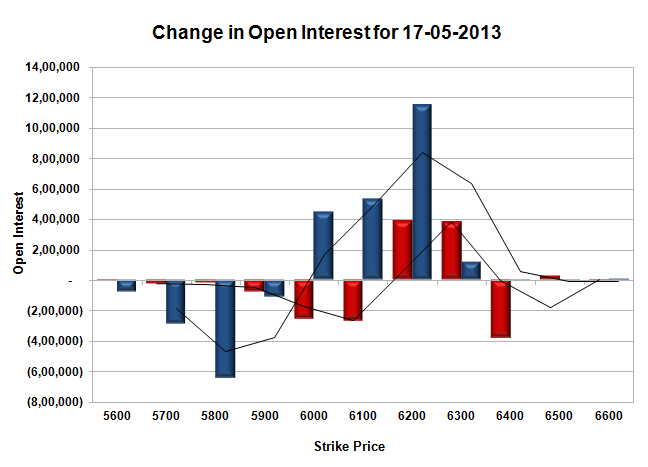 Bank Nifty Open Interest is at 17,79,625, up by 13,075, with decrease in price, most probably small short build-up. FII’s bought 9.28 lacs of Futures, most probably long build-up, as their net OI increased by 28951 contracts and the average price per contract comes to around 6125. FII’s future open contract as on date is 621776. PCR Open Interest (Volume) is again down and now at 1.334. Support still at 6000, though covered huge, but OI still above 70.98 lacs and below that at 5900 with highest OI of 82.91 lacs. Initial and best resistance at 6200, with highest OI on CE side at 78.16 lacs and above that at 6300 with OI of 62.83 lacs. Range as per Option Table is 6046 - 6158 and as per VIX is 6038 - 6151 with 6120 as the Pivot. Nifty opened flat but was unable to sustain above the previous day’s close to touch the lows of 6120. A surge saw the index touch the highs of the day around 6180, but was sold off swiftly towards a new low but closed just up at 6114.10, still a huge loss of 42.80 points. The broader market was also weak, with just 435 advances to 852 declines. Range for the rest of week could be 6000-6220 as per Option Table. 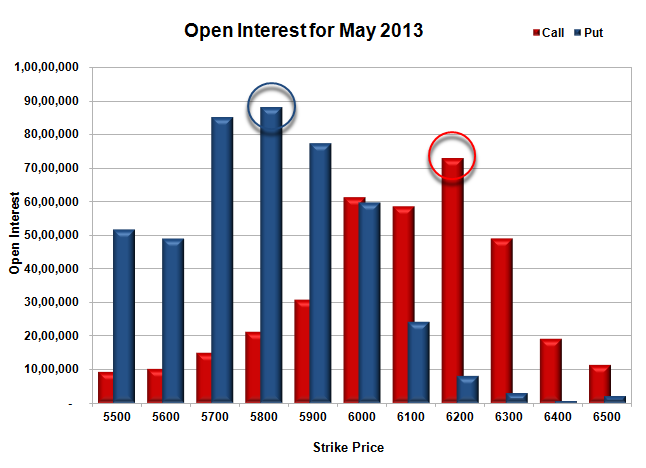 Call option 6100-6400 added 6.85 lacs huge amount of OI with huge profit booking seen at 6400 and above strike prices. 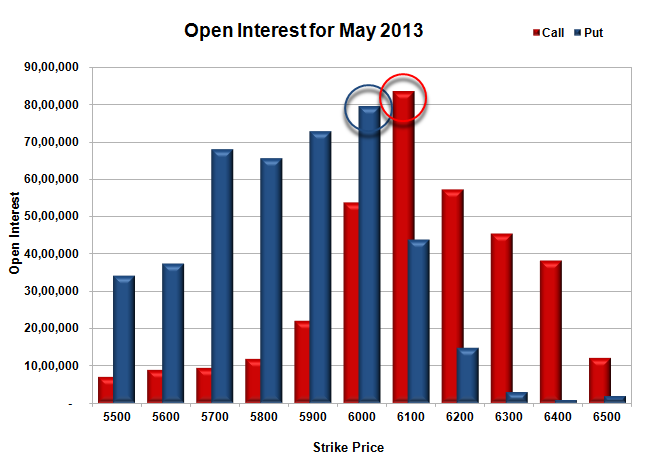 Put option 5900 added 5.92 lacs huge amount of OI with short covering seen at 6200 and above strike prices. Highest accumulation on Call option 6200 at 73.61 lacs & 6300 at 62.91 lacs whereas Put option 5900 at 78.40 lacs & 6000 at 76.89 lacs. 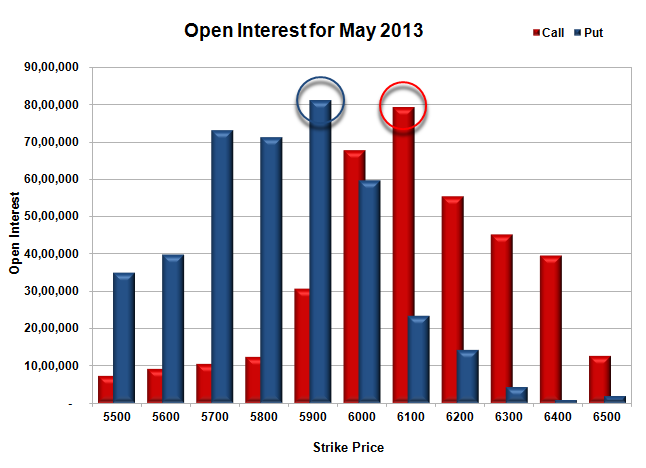 Nifty Open Interest is at 2,59,55,900 up by 1,94,000, with decrease in price, most probably some short build-up. 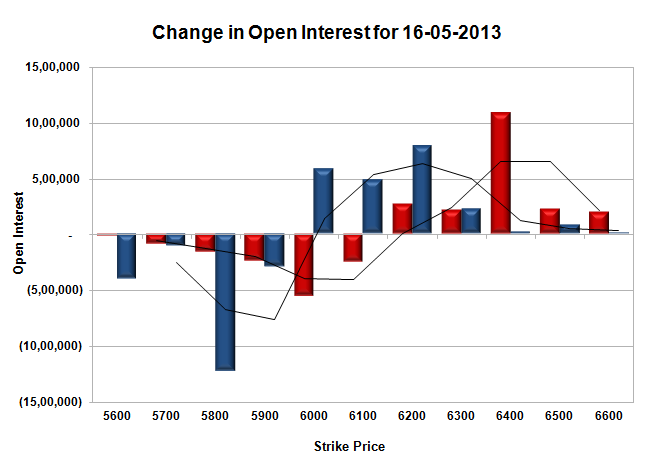 Bank Nifty Open Interest is at 17,66,550, down by 97,850, with decrease in price, most probably long liquidation. FII’s bought 6.25 lacs of Futures, most probably long build-up, as their net OI increased by 27881 contracts and the average price per contract comes to around 6139. FII’s future open contract as on date is 592825. PCR Open Interest (Volume) is has gone down again but still comfortably placed at 1.346. 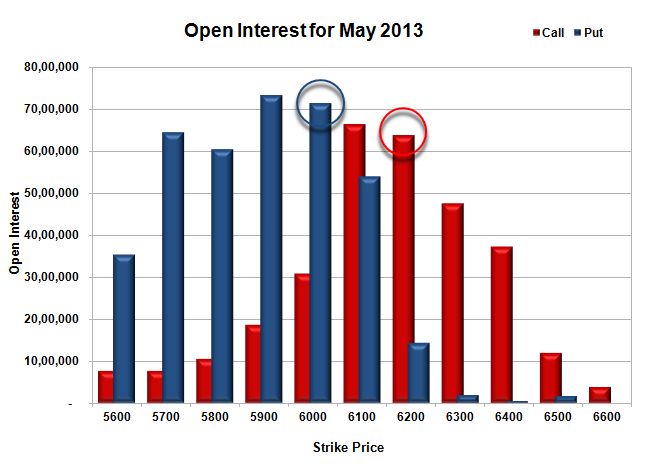 Good support at 6000, with OI above 76.89 lacs and below that at 5900 with highest OI of 78.40 lacs. 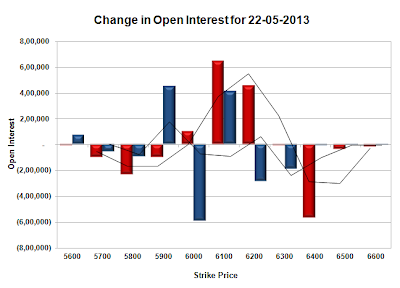 Initial and best resistance at 6200, with highest OI on CE side at 73.61 lacs and above that at 6300 with OI of 62.91 lacs. 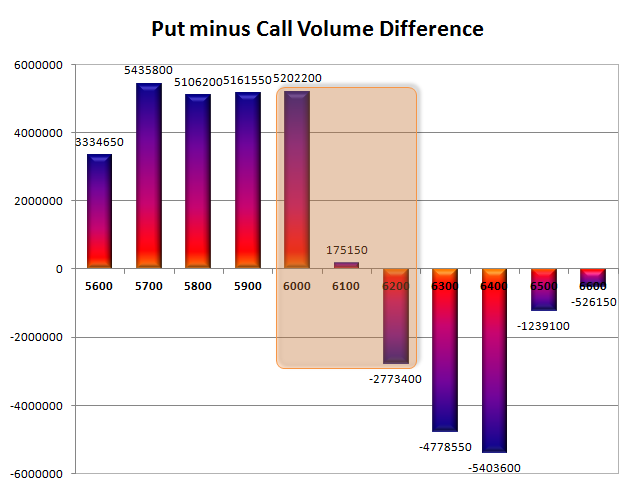 Range as per Option Table is 6071 - 6183 and as per VIX is 6057 - 6171 with 6150 as the Pivot. Nifty opened positive and stayed in a small range of 20 points for the first few hours of trade, but started selling off in the afternoon session to lows of the day at 6146 but closed just above at 6156.90, still a good loss of 30.40 points. The broader market was also weak, with just 542 advances to 759 declines. Range playing out as per Option Table right now is 6000-6250. 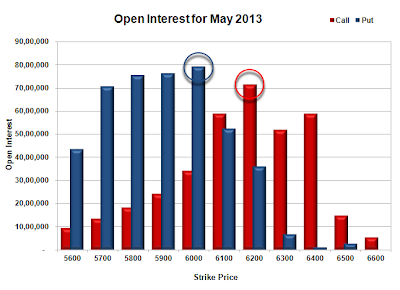 Call option 6300-6400 added 7.86 lacs huge amount of OI with huge short covering seen at 6100 and below strike prices. 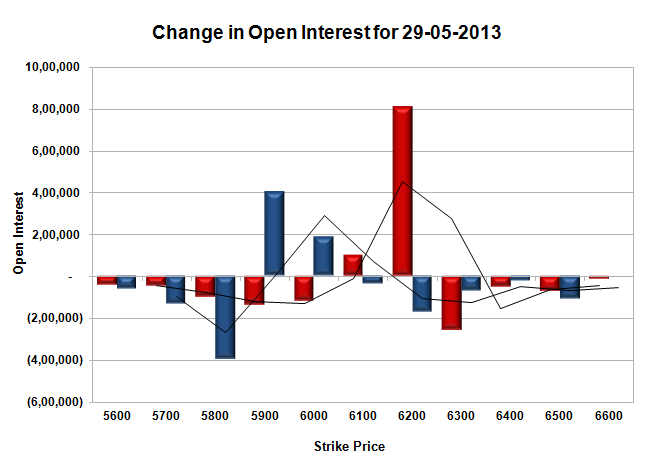 Put option 6300 added 2.06 lacs huge amount of OI with profit booking seen at 6000 and lower strike prices. Highest accumulation on Call option 6200 at 71.36 lacs & 6300 at 60.28 lacs whereas Put option 6000 at 77.22 lacs & 5900 at 72.48 lacs. 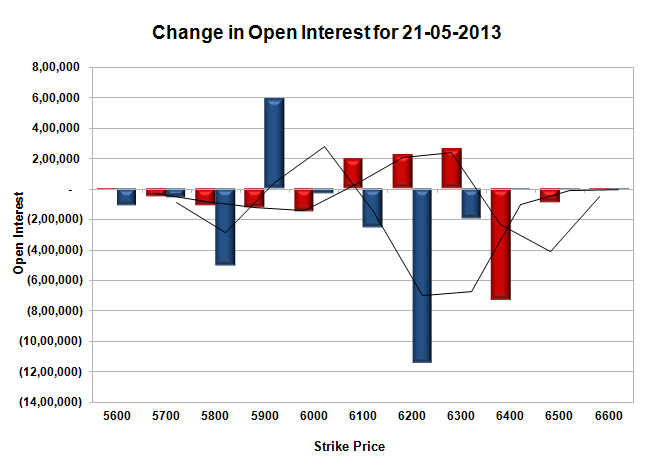 Nifty Open Interest is at 2,57,61,900 up by 1,18,250, with decrease in price, most probably some short build-up. 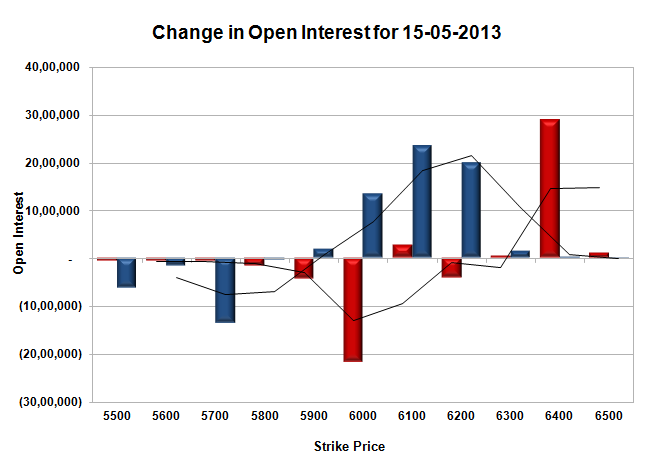 Bank Nifty Open Interest is at 18,64,400, down by 1,30,800, with decrease in price, most probably long liquidation. FII’s bought 1.97 lacs of Futures, most probably long build-up, as their net OI increased by 12307 contracts and the average price per contract comes to around 6190. FII’s future open contract as on date is 564944. PCR Open Interest (Volume) is has gone down due to huge liquidation seen at 6000-5800PE levels and now at 1.372. Initial Support at 6100, but OI is just 56.2 lacs and below that at 6000 with highest OI of 77.22 lacs. 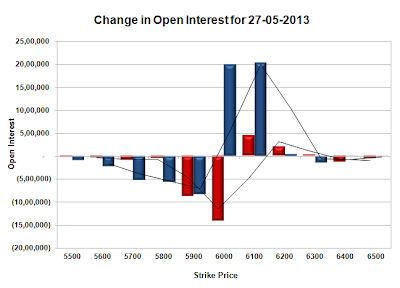 Initial and best resistance at 6200, with highest OI on CE side at 71.36 lacs and above that at 6300 with OI of 60.28 lacs. Range as per Option Table is 6116 - 6228 and as per VIX is 6100 - 6214 with 6150 as the Pivot. Nifty opened positive but sold off within the first few minutes, but saw consolidation within a range of 20 points for the better part of the day. A huge breakout near the end of day saw the index moving up and touching the highs at 6199.95 but closed just below at 6187.30, still a gain of 17.40 points. On a week on week basis the index gained 80.05 points of around 1.31%, a fifth straight week of gain. The broader market though was weak, with just 584 advances to 688 declines. Bulls have added huge at 6200PE and may try to move the index above 6200 for the coming week, but the 6200CE writers are still holding on. Call option 6200-6300 added 7.69 lacs huge amount of OI with huge short covering seen at 6100 and below strike prices. Put option 6300-6000 added 22.54 lacs huge amount of OI with profit booking seen at 5900 and lower strike prices. Highest accumulation on Call option 6200 at 75.32 lacs & 6100 at 56.13 lacs whereas Put option 6000 at 83.65 lacs & 5900 at 75.08 lacs. 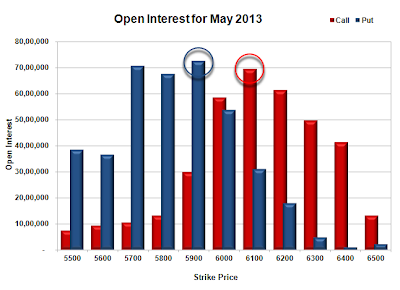 Nifty Open Interest is at 2,56,43,650 up by 36,950, with increase in price, most probably long build-up. 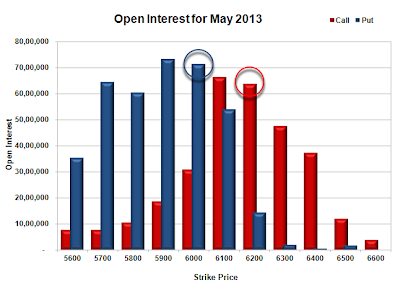 Bank Nifty Open Interest is at 19,95,200, down by 76,875, with increase in price, most probably short covering. FII’s sold 4.96 lacs of Futures, most probably long liquidation, as their net OI decreased by 5746 contracts and the average price per contract comes to around 6225. FII’s future open contract as on date is 552637. PCR Open Interest (Volume) is comfortably placed at 1.439. 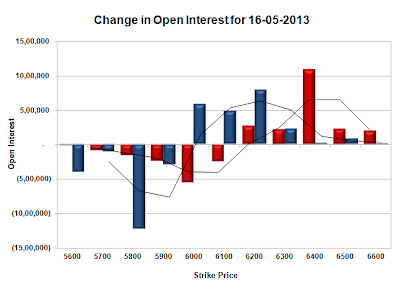 Initial Support at 6100, with OI of 57.88 lacs and below that at 6000 with highest OI of 83.65 lacs. Initial and best resistance still at 6200, though price is hovering around the level and above that at 6300 with OI of 55.72 lacs. 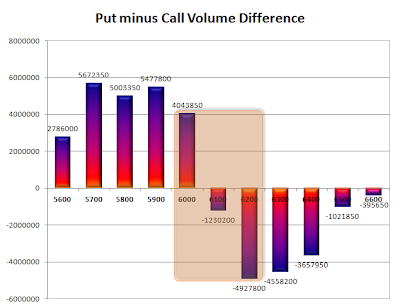 Range as per Option Table is 6123 - 6238 and as per VIX is 6130 - 6244 with 6170 as the Pivot. Nifty opened weak after the huge up-move of yesterday, but the responsive buyer were just waiting for this dip, grabbed the opportunity and moved index up, just shy of 6200. The index stayed within a small range of 25 points after that and ultimately ended the day in-between at 6169.90, still a good gain of 23.15. The broader market though was weak, with just 636 advances to 662 declines. Bulls have added huge from 6000-6200PE and now 6000 is the best support. Call option 6200-6600 added 20.10 lacs huge amount of OI with huge short covering seen at 6100 and below strike prices. Put option 6500-6000 added 21.98 lacs huge amount of OI with profit booking seen at 5900 and lower strike prices. 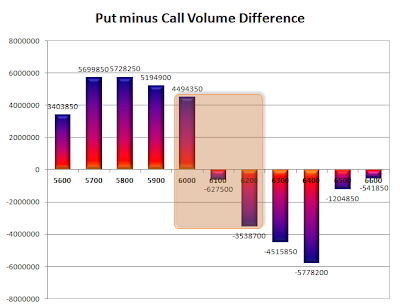 Highest accumulation on Call option 6200 at 71.45 lacs & 6400 at 58.96 lacs whereas Put option 6000 at 79.16 lacs & 5900 at 76.20 lacs. Nifty Open Interest is at 2,56,06,700 up by huge 5,14,400, with increase in price, most probably huge long build-up. 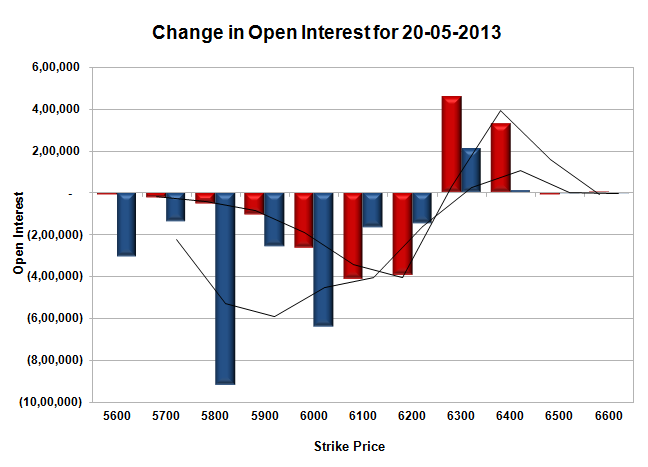 Bank Nifty Open Interest is at 20,72,075, down by 4,300, with huge increase in price, most probably small short covering. FII’s bought 0.97 lacs of Futures, most probably long build-up, as their net OI increased by 24122 contracts and the average price per contract comes to around 6207. FII’s future open contract as on date is 558383. 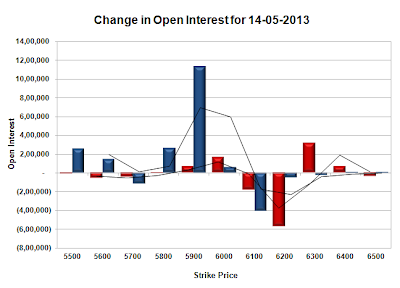 PCR Open Interest (Volume) is hovering above 1.4 and now at 1.401. Good Support at 6000, with highest OI of 79.16 lacs and below that at 5900 with huge OI of 76.20 lacs. 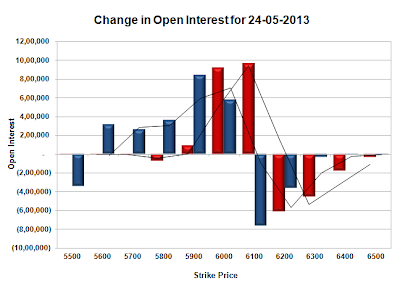 Initial and best resistance at 6200, with highest OI on call side at 71.45 lacs. Range as per Option Table is 6104 - 6223 and as per VIX is 6113 - 6227 with 6150 as the Pivot. Nifty opened just positive and went higher and higher with each passing hour to scale one psychological level after another to end at 28 months high at 6146.75, with a huge gain for the day at 151.35 points and in process covered all that was lost on Monday with a few more. The broader market also performed well, with just 865 advances to 424 declines. The PE writers have added huge from 600-6200 levels and now support is placed at 6000. Call option 6100, 6300-6500 added 33.32 lacs huge amount of OI with huge short covering seen at 6000 and below strike prices. 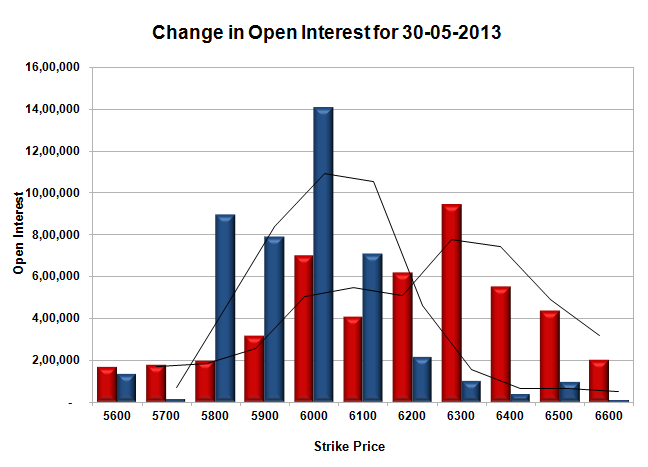 Put option 6300-5900 added 60.08 lacs huge amount of OI with profit booking seen at 5800 and lower strike prices. 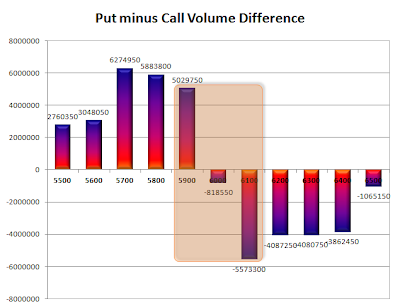 Highest accumulation on Call option 6200 at 68.70 lacs & 6100 at 61.30 lacs whereas Put option 5800 at 87.79 lacs & 5900 at 79.33 lacs. Nifty Open Interest is at 2,50,92,300 up by huge 25,48,600, with increase in price, most probably huge long build-up. 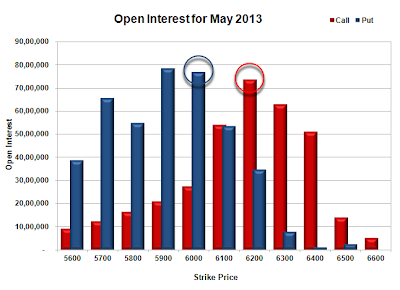 Bank Nifty Open Interest is at 20,76,375, up by 1,69,575, with huge increase in price, most probably long build-up. FII’s bought 4.05 lacs of Futures, most probably long build-up, as their net OI increased by 24963 contracts and the average price per contract comes to around 6189. FII’s future open contract as on date is 534261. PCR Open Interest (Volume) is now up at 1.412. Support jumped up at 6000, with huge addition for the day and now OI above 73.33 lacs and below that at 5900 with huge OI of 79.11 lacs. 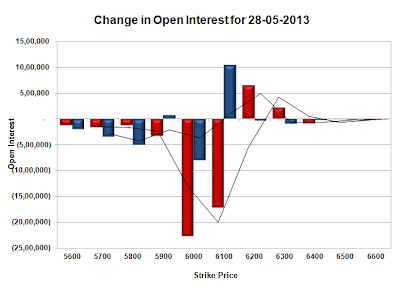 Initial and best resistance at 6200, with highest OI on call side at 68.70 lacs. Range as per Option Table is 6064 - 6175 and as per VIX is 6088 - 6205 with 6110 as the Pivot.